The popular all-time classic “ 4 in a Row ” in the to-go edition as a free app for your smart phone. Play against your friends, beat the computer or look for opponents from around the world to see who has the better tactics or strategy to win the game. In “4 in a Row” the players take turns dropping colored discs into a grid. 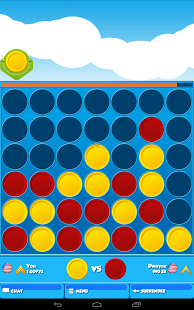 The aim of the game is to connect a row of four of one’s own colour, either vertically, horizontally or diagonally. If you win against your online opponent in the online multiplayer mode, the corresponding points will be credited to your account. If you win against a very skilled “4 in a Row” opponent in the online multiplayer mode, you will receive more points for your win and will be credited to your account. The more points you gain whilst playing “4 in a Row”, the higher you will rise in the ranking list. Create your online friends list to invite your friends at any time to a match of “4 in a Row” for free. Talk to your opponents worldwide with the integrated chat function. The all-time classic “4 in a Row” is available worldwide as a free app. You can therefore play online against international opponents. How good are your tactics, are you better at logical reasoning than your opponent? Will you be first in connecting a row? Simlple and fun Great time killer and has all the modes one could want. I have no problems with this game. I like the difficulty of hard mode because it makes you think. Only downside is that sometimes computer makes the same moves every game. Gr8 but It’s awesomee but it crashes down.. I give 4.5 star..